If you are on Facebook at all, you may have noticed a lot of runners posting about this year's Runner's World Run Streak. The goal of the streak is to run at least one mile per day for the 37 days between Thanksgiving and New Year's Day. The purpose of the streak is to keep you moving through the holidays. Runners are encouraged to post their runs and hashtag them on FB, IG, and Twitter. It's a tradition that RW has been hosting for the past couple of years. This is one tradition I'll be taking a pass on. You know I love to run. Sure, I've Turkey Trotted the last couple of years. I run on Christmas Day and on New Year's Day. Last year I ran in the Underground Polar Express run and I'll be doing that one again. I'm not above running traditions. But run every single day during the holiday season? Actually during any season? No thanks. I have a couple of friends who have been streaking for much longer than 37 days, which is pretty cool. You probably have a few of those friends too. But I've got a few reasons not to streak. 1. I'm prone to injury. Right now I'm battling plantar fasciitis. And yes, it's painful. It doesn't hurt when I run, but it hurts like hell when I'm done. Taking a day or 2 off between runs really helps it calm down. I probably shouldn't be running at all, but heck, it's PF, and it is what it is. But a daily run probably wouldn't be my friend. 2. It's cold this time of year, and getting dressed to head out the door for a run would probably take longer that running the actual mile. I just don't think I could swing it on those days that I'm at work for 9 hours. Sure, I could run on the treadmill. Sure. 3. I don't need any more incentive to run. I run 4 days per week, and I rarely miss a run. But I bet I'd start to feel pretty burnt out running every day! 4. The extra laundry would put me over the top. I have teenage boys, remember, and their laundry baskets get filled if a shirt touches their body for even a minute. Add to that 7 running outfits? Ayyy. 5. Not that I care what people think, but my neighbors already think I'm nuts. Although Mrs. Kravitz would certainly be on top of neighborhood happenings! To those of you streakers out there, I bow down to you. Your devotion and tenacity is admirable. But for me? Streaking just isn't going to be one of my holiday traditions. Do you streak? What has been your longest running streak? Are you in the Chicago area? 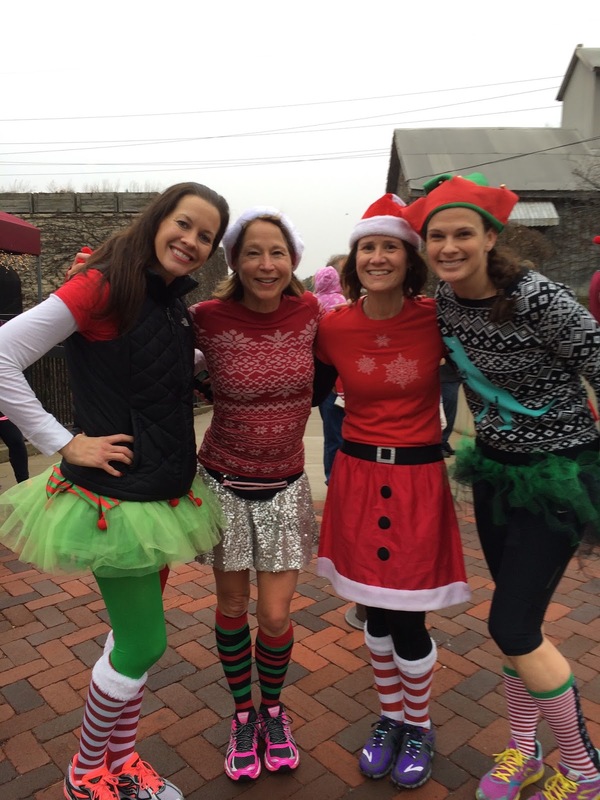 You should consider the Underground Polar Express Run, which benefits the Batavia Suicide Prevention Services. It's a great cause and a really fun day. I've heard that it is a good way to recover. Mostly I won't do it because my foot is really angry at me. I agree for every reason you have given. I don't understand the streaking and those that are running for year after year, no thanks. I am also injury prone, although my injuries seem to happen while getting bitten by a dog, Zumba class, TRX class.....I definitely have a problem away from running! Ha! I can't blame running for all my injuries, either... but streaking would definitely make it worse! I totally agree with you that streaking is not for me (not that I can do it right now, anyway). You have to listen to your body, and you must rest! I guess you could say that I'm bike-streaking right now, but considering that I am unable to do much of anything else, I think that it is a wise decision. Plus, it is no-impact. I'm hoping to get a bike trainer so I can get some of that no-impact exercise over the winter. My foot is begging me to stop. Totally with you on this one. I've never streaked, never wanted (in running or elsewise) -- the most days I've ever run in a row were 5. I want to look forward to my runs, and if I went every day, I think I'd start dreading them. No streak for me either. I am a minimal mileage runner and I like to keep it that way. Not moving is not an issue here, thankfully. I may have to check out that polar express. First do I have something festive to wear? After I did the summer streak, I decided on not doing another run streak. My body doesnt hold up well to running every day and also for me, it took the fun out of run because I felt like I HAD to do it every day. I'm glad to know im not the only one that is not streaking this year! See, that's how I felt! I don't want to dread running. During this time of year, running is my stress reliever. I passed also. I was going to do it but then thought why risk injury for a couple of extra miles a week. I run five days a week and that works for me. Besides, I'm not getting any younger and these old bones need a rest. That's my excuse too, altho I hated to put it out there! I already whine enough about getting older! I am not a streaker either. I am a quality vs. quantity type of runner and I just would not be able to recover from hard runs if I didn't have rest days in there. That's how I feel. Quality over quantity. Right there with you. I'm streaking for the first time for a few reasons. I like to run 4x/week, but I've been stuck at 3x/week lately, and I really want to show myself that I can handle 4x/week again. I also like that it's teaching me to focus on running truly easy on some days. I definitely don't think that I'd do the RW streak every time it comes around, but it's a nice, concrete thing while I'm in a month of transition! I like your reasoning! And cutting back to 4x/week will feel like a vacation after running every day! I need to cross train! Especially now. Damn PF! I've never participated in a streak. If I'm going to take time to get dressed and all electronic-ed up, I'm running more than a mile. Preferably five. And that would probably lead to complications for this old gal. I find clothes in the laundry hamper I KNOW my boys didn't wear. If they touch it with their hands, it goes in! My laundry is unimaginable. I live in that room. See that is me exactly! We really are #solesisters. No streaking here. Maybe if I lived in a warmer climate but it takes too long to get ready to just run one mile I run 4 days a week that is fine with me. I am right there with you: injury prone and dealing with the snowy weather means no running streaks for me! I did, however, commit to doing a 30 for 30 challenge - 30 minutes of activity for 30 days. I run 4 days a week, but this really ensures that I'm getting some cross training in there too! I bike with my indoor trainer, and do Pilates videos to supplement strength training. Day 2 and so far I'm good! Oh, yes, I'm participating in SweatPink's #HolidaySweat. I can do something every day...just not run. I'm with you on that! The laundry would be out of control running 7 days a week! I think if you're healthy, it's a great challenge, but it's definitely not necessary. Quality over quantity is my motto. Or is that everything is moderation? That first GIF had me laughing so hard! I did that streak last year but yep - it was soo much for me & I ended up injured - as usual. sigh. Did you see the movie Old School? That's where it's from. Hilarious. So I actually tried to do a streak once because someone asked me to join their streak, and I really did not enjoy it. I think it's great for people who aren't already active, but for me, running everyday meant less time for things like yoga and strength on days when I would normally not run and cross-train, which is actually a negative thing rather than a positive. It is more beneficial for me to run 4-5 days a week and get in some cross-training the other days than fitting in a couple of miles everyday. A streak is good for non-excercisers....but not for us! I'm right there with you. I love my cross training! I knew you'd agree...I do love my cross training! AMEN. I am right with you for all of your reasons listed. And honestly, it's not worth struggling into (and out of) a sports bra for one stinking mile. Who would have thought about that, right? I did the RW running streak 2 years ago and I actually ran everyday ( thanks to my treadmill), but the hardest part was remembering to record it. Now that I have my own training plan for the marathon coming up in January, I won't be streaking. It just seems like so much of a chore to me! I've never done a streak and I never plan too - I value my rest and recovery too much! Plus, like you said, the laundry would be ridiculous! I'm starting training for a early spring half in a couple weeks, and streaking just doesn't fit with my bigger goals. I've got a March half and that April full...that will be enough running for me! I have been where you are with the PF! And I've missed the streaking many times. But this year, it's a good year to do it and it's working out okay. You're right, though -- getting on all the clothes hardly makes it worth it. I am a very early-morning runner, and in the dark, my neighbors can't see (or smell) the mornings that I "revisit" the ensemble that I wore for the 1-miler the previous day. Shhhhh! :) Get better with that heel -- PF is no joke (just ask Peyton Manning). I did the RW Holiday Streak two years ago and don't plan on doing it again. The daily runs became burdensome for me - it was just another thing to check off the to-do list! It took away from the joy of running when it became an obligation. Plus, I am injury-prone, too, and was worried about exacerbating things! I definitely need to work on consistency, but not sure streaking is for me either. For some of the reasons you mentioned. Mainly injury and laundry!! Lol. I don't streak, but I so admire all of those who do! Just Wow! I saw someone the other day posted over 1000 days in a row! For sure, it is admirable! Just not for this runner. I am in the same position as you when it comes to injuries although some streakers I know SWEAR that streaking has prevented injuries. Maybe one day but not during the Holidays! Oh for sure not now...I'm so overwhelmed! I hadn't thought about the laundry but that's a GREAT reason not to streak. Yikes! Me neither. I pay a smart coach a lot of money to tell me what to do. If he tells me to streak then I will. I don't really need incentive to keep moving - I am doing something if it isn't running! I seriously doubt Becky would ever tell me to streak! Oh, wine streaking? Now that's a streak I could get on board with! Yes to all of this! I streaked once and while I'm glad I did it, I don't think I'll ever do it again. I was so ready for a rest day by the end! And I'm currently injured and never want to be this way again so there's no way I could do it anyways. Enjoy running whenever you want! I don't ever want running to feel like a chore! It's a great challenge but I don't need the motivation either. It's kind of fun to mix it up, isn't it? I totally feel you but I think I am going to try it. The laundry matter though - will be SERIOUS for real. Oooh, Diatta! Let me know how it goes! I won't be streaking (at least run steaking-lol) either....prone to injury, don;t want to make running a chore, too much pressure! We seem to be in good company! I won't be streaking either. I don't do cold very well. Lol! Another reason that I didn't mention. The cold doesn't stop me from running, but maybe if I had to go out in it every day? Nope, no streaking for me either. My legs need rest, and I never ever ever want running to be a chore. That sounds like a big fat chore to me, LOL! No streak for me. I ran my fourth marathon this month and had a 7 minute PR. My training was 3 days running, 2 days cycling, with 2 rest days. That's all this 51 year old body wants! Sounds similar to mine! I run 4 days/week with 2 days of cross training. I don't think I could do more than that. I am with you!! No streaking for me either! Well, I can sure understand why you wouldn't want to streak!! I don't streak. It's just not for me and I know that I would fail, lol. I'm not disciplined to do it every single day and sometimes with life, it's just not possible! I need the recovery time, too, so I'll never streak. I think ten days is about the longest streak for me - years ago. I wasn't going to be able to run for a week or so, so I ran several days in a row leading up to it. As always, thanks for linking up! I agree 100% with you on this one. Streaks are definitely not for me. I love to run and I don't have to do it everyday to prove something. I'm sure it's a fun thing to do with RW or any group but I also do a lot of cross-training and don't necessarily "need" to run everyday. Also, the laundry thing!!! YES!!! I don't normally streak, ether, as I like to just stick to my typical routine. But I do enjoy watching the social media posts from all those who are streaking this holiday season! Oh, yes, it's fun and admirable! Just not for me. Like you I'm prone to injury so that would NOT be a good thing for me. I tried a streak once many many years ago and I made it 26 days in a row. I think my average distance was 4km per run. That's probably why I only made it 26 days, ha ha. I just hate the idea of making a chore out of running! I could never do a running streak either. Way too much work to get dressed, warm up go out, etc. I would definitely have BORE OUT within a week. Kind of takes the fun out of running! I'm still active everyday. Walking count too right? I don't think walking counts for the run streak. But it's still good to keep moving, right?